Having a vacation in KL soon with your family? Seeking the best Muslim friendly hotels in Kuala Lumpur for your Halal honeymoon? These articles will help you find the most luxurious hotels in Kuala Lumpur, and believe it or not, they are all quite affordable! You will enjoy a pleasant and well-pampered stay at these 7 best five-star hotels! The opulent and grand hotel of The St. Regis Kuala Lumpur is one of the newest addition to the long list of top five-star hotels in KL, Malaysia. 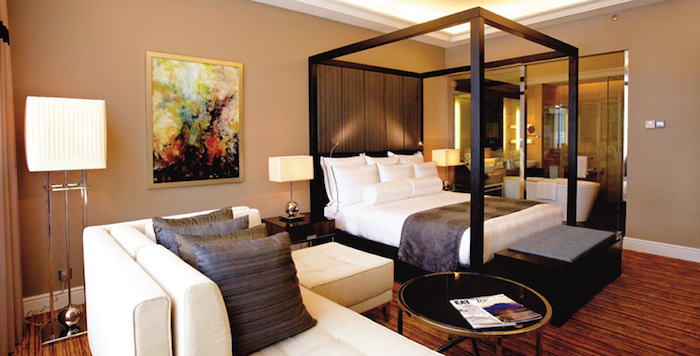 The luxurious hotel claims that their standard guest rooms are the largest in KL! If you are to stay at this hotel, you will be able to enjoy the beautiful view of the city, thanks to its floor-to-ceiling windows. In addition to their outdoor pool, you can also make a full use of their state-of-the-art fitness centre and fully serviced spa. It is definitely one of the best Muslim friendly hotels in Kuala Lumpur! Would you like to stay at a five-star hotel in KL that is strategically located near a train station and a shopping mall? Then, Sheraton Imperial is one of the best Muslim friendly hotels in Kuala Lumpur, Malaysia, that you should pick. Situated right opposite the Quill City Mall, it is also only 5-minute away from KL Monorail Station by car. Besides excellent hospitality and professional service, you can also enjoy staying in its luxurious hotel room that comes equipped with modern furnishings and complete room amenities. The best thing about this luxury hotel is that its price is very affordable, which is less than $100 per night! Mandarin Oriental is also one of the best five-star hotels in Kuala Lumpur. Perhaps, this is also one of the hotels that have the best view of the KL skyline. 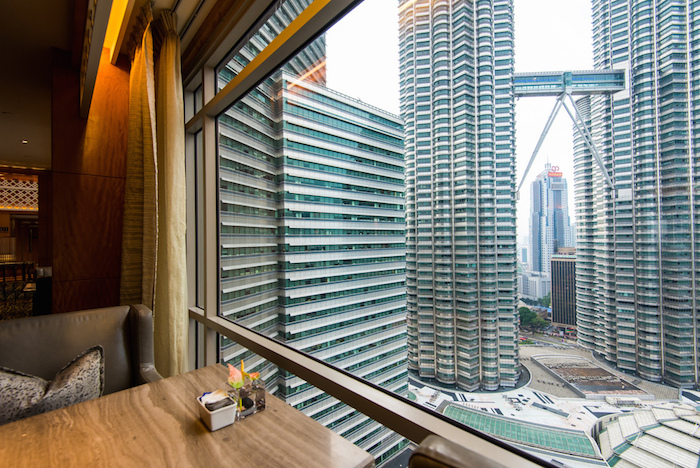 It is located right in the KLCC area, overlooking the great Petronas Twin Tower. With its opulent hotel rooms, luxurious furnishings, and a grand bathtub installed right in front of the floor-to-ceiling glass window, you will enjoy a fun and romantic honeymoon moment with your spouse – it is perfect for honeymooners! Spacious guest rooms, luxurious marble bathroom, a lavish spa, and top-notch restaurants – these are some of the perks that you will enjoy if you choose to stay at the Ritz-Carlton KL. Another great thing about the Ritz-Carlton is that it is located in the lively area of Bukit Bintang. 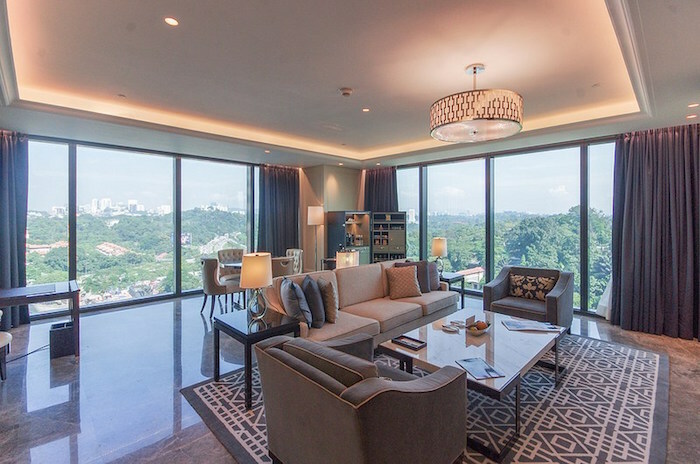 You can easily walk to some of the top places in KL while staying in this luxury hotel. Even though it’s a five-star hotel with world-class services and high-quality furnishings, the room price is very affordable as it starts from as low as $150 per night! As you can see by now, KL is never short of luxury hotels. 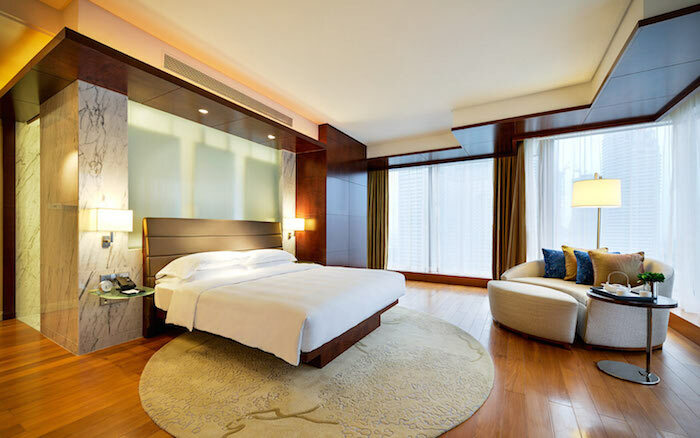 Grand Hyatt Kuala Lumpur is another best option for those who seek to have a fantastic holiday experience in Malaysia. This five-star hotel will provide you with the stunning view of the Petronas Twin Tower (this skyscraper looks amazing at night as it lit brightly!). Besides enjoying the comfortable bed in a spacious, well-decorated room, you will also enjoy dining at its Halal restaurants and visit the nearby attractions. It is, indeed, one of the best Muslim friendly hotels in Kuala Lumpur! Not all top hotels in KL feature tall and modern buildings. 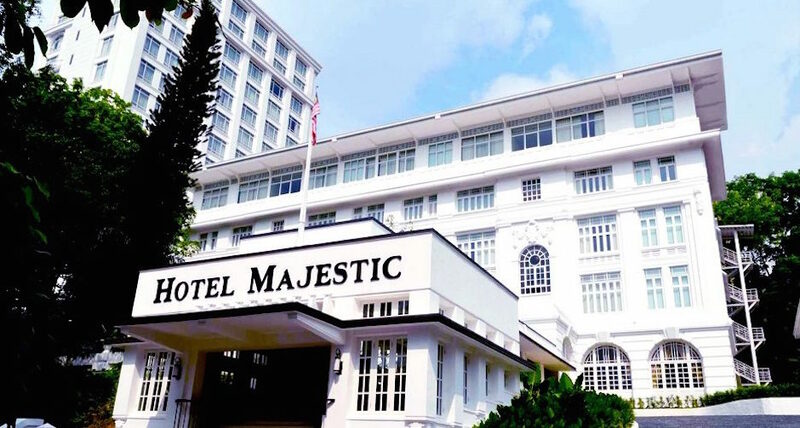 If you’d like to stay in a luxury hotel with a taste of oriental design and portrays a nice sense of history, then you should choose The Majestic Hotel Kuala Lumpur. As you arrive at the hotel, you will be amazed by looking at the beautiful building and its elegant colonial-style decor. Plus, it is also strategically located in KL city. By staying at this five-star hotel, you can walk to Merdeka Square to learn a thing or two about Malaysia’ long history. You can also take pictures at the beautiful historical building Bangunan Sultan Abdul Samad. Another top hotel in KL that is ideal for Muslim travellers is the Hilton Hotel KL. 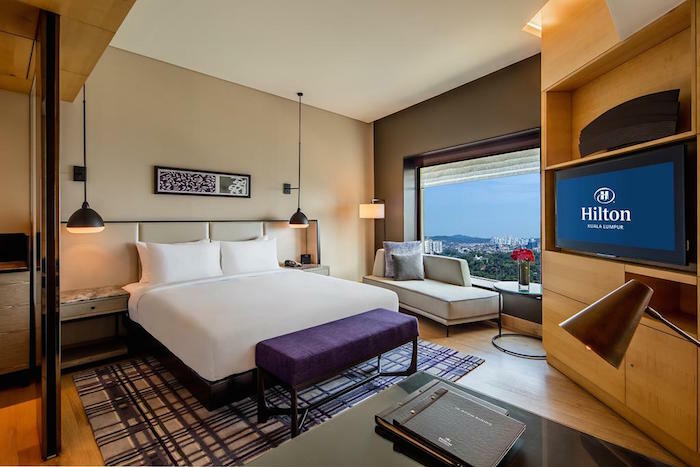 You can choose to stay at this five-star hotel to experience a fun and enjoyable stay during your family holiday in Kuala Lumpur. The hotel offers a big outdoor pool with a waterslide – your kids will love it! Plus, it is also one of the hotels with the best restaurants in town! There are up to 6 restaurants in this hotel and they are quite popular amongst the locals. So, do not be surprised to see these restaurants being packed with customers during lunch or dinner time! While planning for your Halal vacation in Malaysia, make sure you consider one of the best Muslim friendly hotels in Kuala Lumpur above. 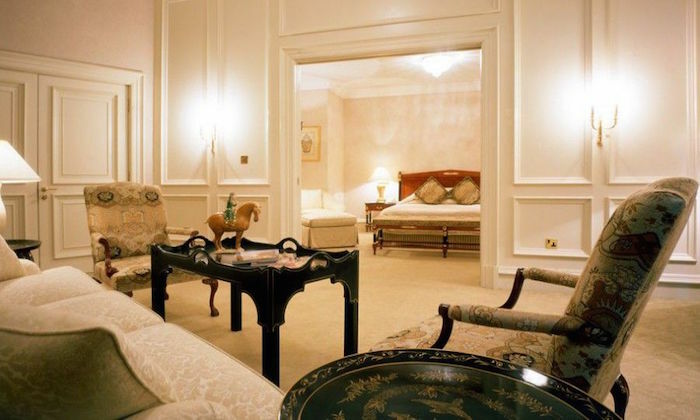 They are super luxurious and offer excellent guest rooms and complete facilities.